Stubbs is a 16-year old cat from Talkeetna, Alaska. Apart from being a resident, he’s also the mayor of the 876 residents of the little town. 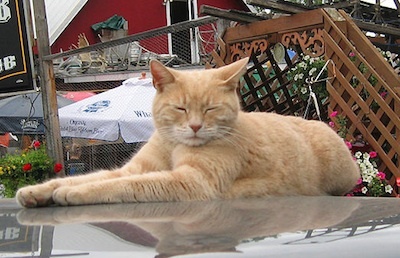 A bit weird perhaps, but apparently in the USA cats are smart enough to govern a town. I found out about the existence of Stubbs through Wikidata, more specifically using Magnus‘ WikiDataQuery. It’s a fun tool to query the almost 15 million items available there. My query was pretty simple: give me all items that have a ‘position held’ of ‘mayor’ and are not an instance of ‘human’. Turns out there’s actually one other non-human mayor in Wikidata: Samwise Gamgee, from Tolkien’s Lord of the Rings. I admit that querying Wikidata for non-human mayors might not be the most useful thing in the world, but it shows that the system works and can lead to interesting facts. What oddities can you find using Wikidata?